Hello Design Diary readers! Sarah here with Lace & Pine Designs. Over a year ago I purchased this amazing Joel Dewberry rayon chalice with the intention of sewing mommy and me dresses. I sewed up my daughter a self-drafted dress and then never got around to making my own dress. I knew I wanted something flowy and more of a casual style, preferably with an empire waist. 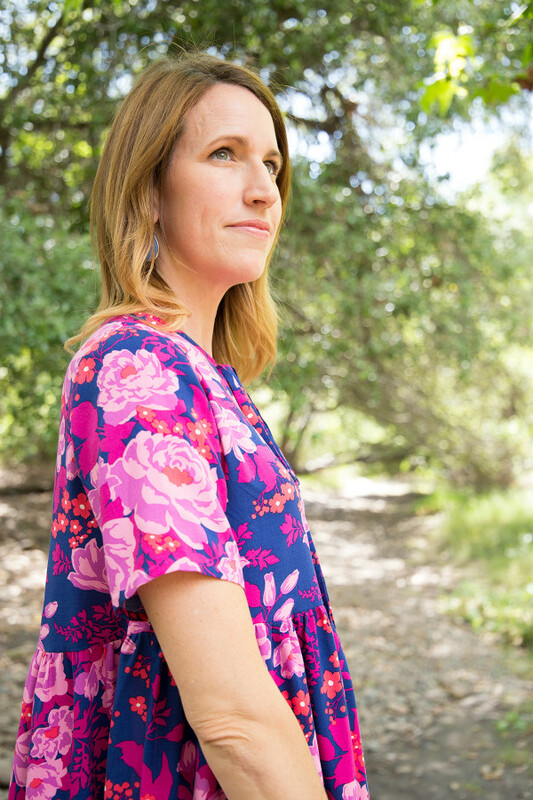 When Megan showed me the sketch for the Sudley dress, I knew it was exactly what I was looking for and I could finally pull out this beautiful rayon I’ve been hoarding. 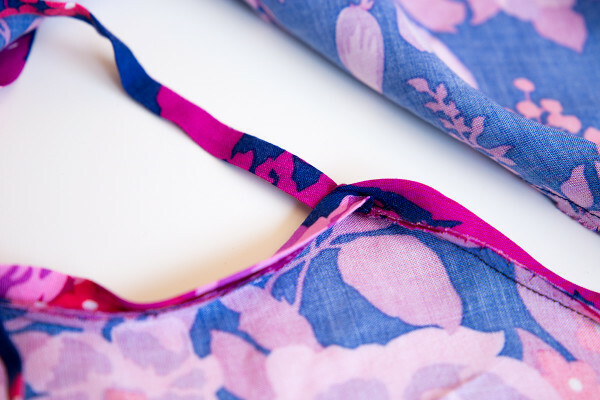 One of the greatest design elements of the Sudley is the keyhole neck or back. Applying the bias facing around that tight curve can be a bit challenging, but it really doesn’t need to be. 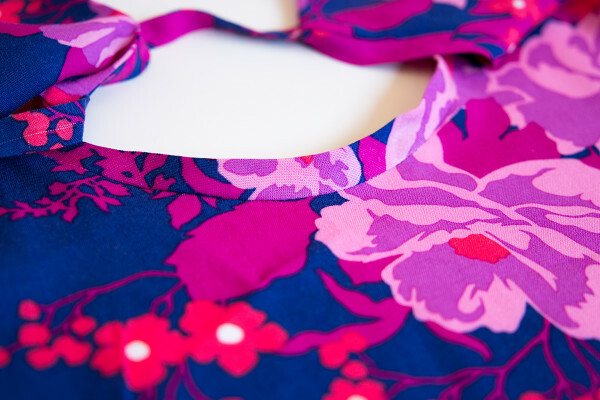 If you have a lining on the dress, you won’t be dealing with the bias facing. 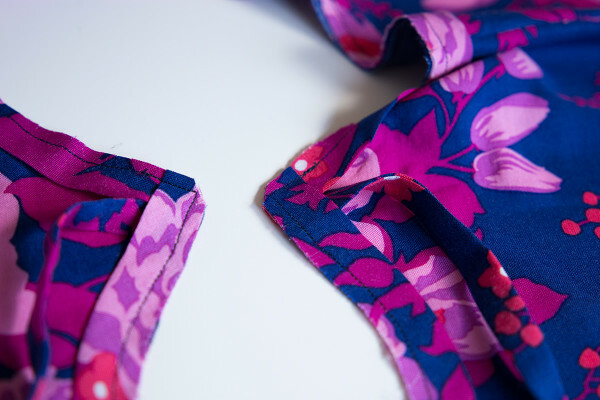 However, I wanted something light and breezy for the hot summer, so I opted to not use a lining and follow the directions for the bias facing for the blouse. Today I’ll be showing you a step by step tutorial of how to apply the bias facing. Hopefully, after reading through this you’ll have no issues and be able to easily create a nice smooth facing without any puckers! Step 1: Prepare the bias tape. You can either cut one really long piece on the bias or cut 4 pieces, per pattern suggestion, and then piece them together. If piecing together, mark one of your bias pieces on the wrong side from one corner across to the opposite side at a 45 degree angle. This will be your stitch line. Overlap 2 of the bias pieces, right sides together, at a 90 degree angle. Pin, then stitch along the drawn line. 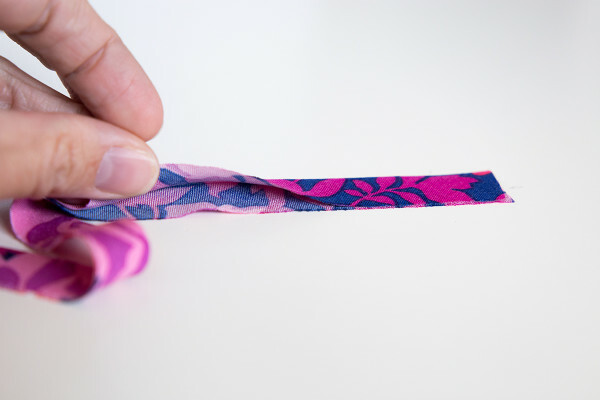 Trim the seam allowance down to 1/4″, then iron seams open. Repeat with the remainder of the bias pieces till you have one long piece. 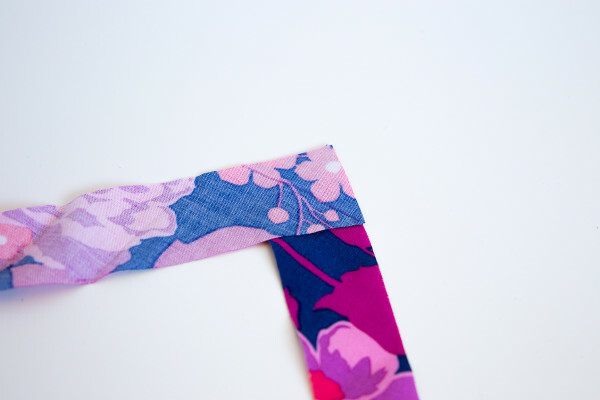 Step 2: Fold the bias tape in half, wrong sides together, matching up the raw edges of the longer sides. Iron flat. 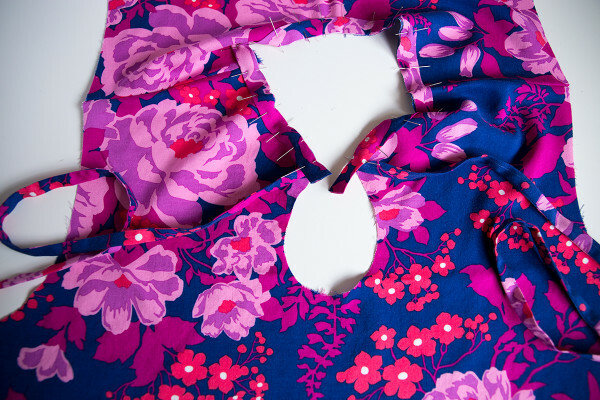 Step 3: When applying the bias tape to the neckline and keyhole, you will be doing the neckline with one piece of bias tape and the keyhole with what’s leftover. We will first start with the neckline. 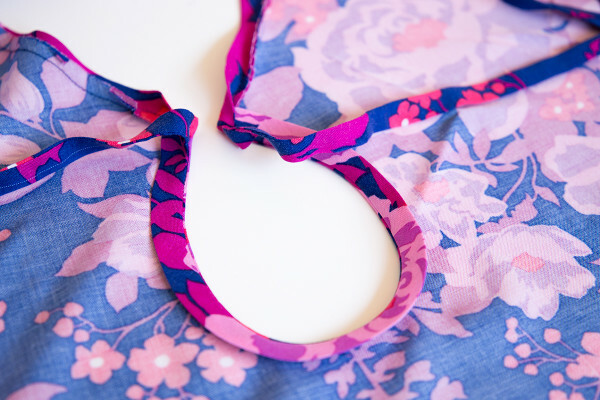 Lay your bodice with both the front and back sides right side facing up. Starting on the edge where the neckline meets the keyhole, match up the raw edges of the folded bias tape to the right side of the bodice along the neckline. Leave about a 1/2″ tail past the raw edge where the keyhole will be. 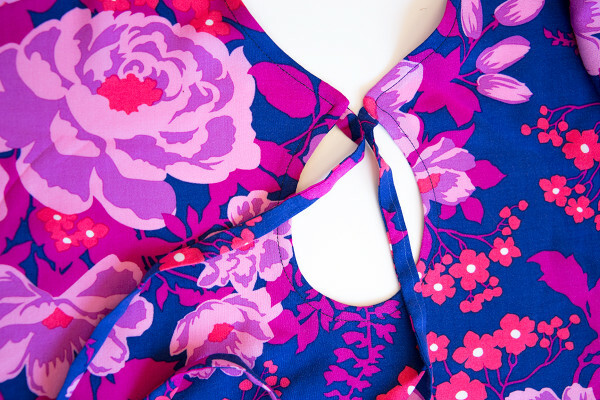 Continue to pin along the neckline. 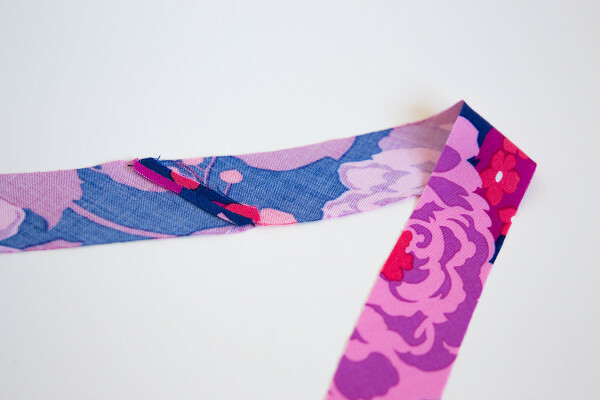 When you get to the end of the other end of the neckline, trim your folded bias tape 1/2″ past the edge. Stitch 1/4″ from the edge around the neckline. Make sure to start on the extra 1/2″ tail at the beginning and finish through the extra 1/2″ at the end. Leave the bias tape as it is. You will not be turning it to the backside until the bias tape is stitched to the keyhole. Step 4: Now moving onto the the keyhole. The keyhole is a tighter curve, so we will be doing some extra steps here. 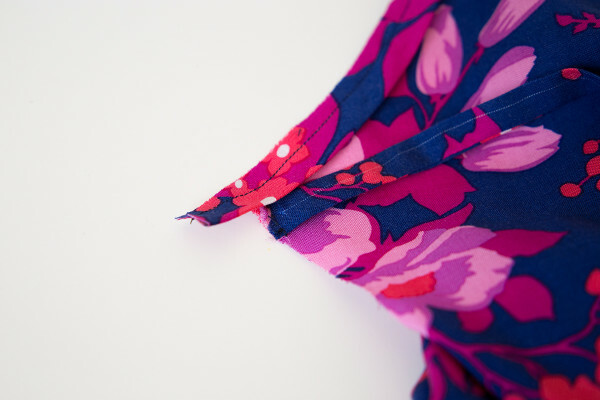 Using small pins you can iron over, pin the raw edges of the leftover folded bias tape to the edges of the keyhole. 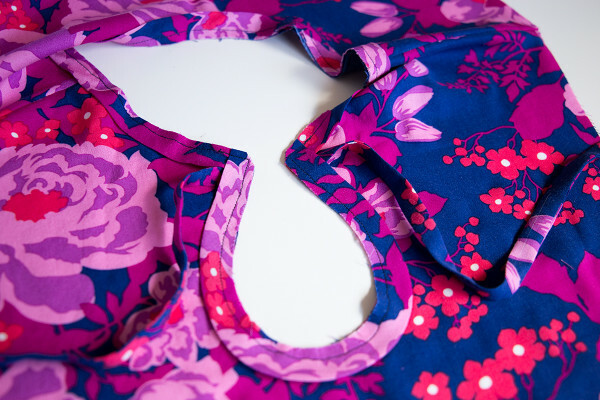 Just like the neckline, you will leave a 1/2″ tail at the beginning and end of the keyhole. 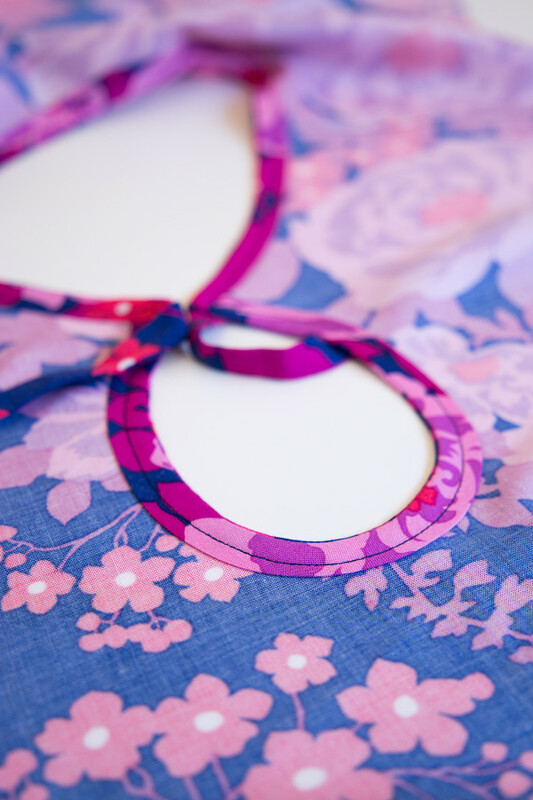 Step 5: When you are done pinning, place your keyhole in it’s desired shape on your ironing board. Steam and press the bias tape and bodice. If you have a fabric that can stretch out, like the rayon I’m using, leave your garment on the ironing board until it is cooled. This will help the keyhole maintain its pressed shape. Step 6: Once the fabric is cooled stitch the keyhole with a 1/4″ seam allowance. 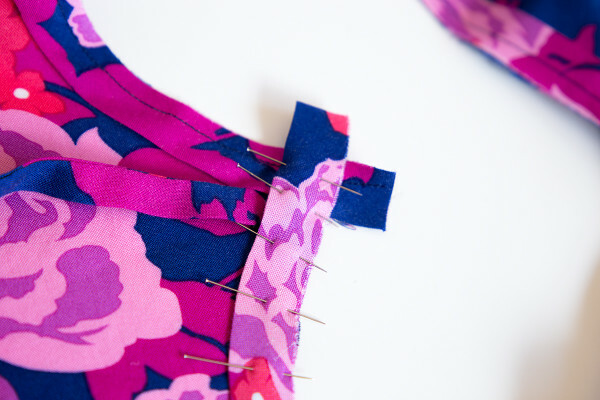 Begin your stitch on top of your neckline stitch just before the bias tape on the keyhole, continue over the bias tape till you get 1/4″ to the edge. While your needle is down, raise your presser foot, rotate your fabric, lower your presser foot back down and continue stitching around the keyhole. 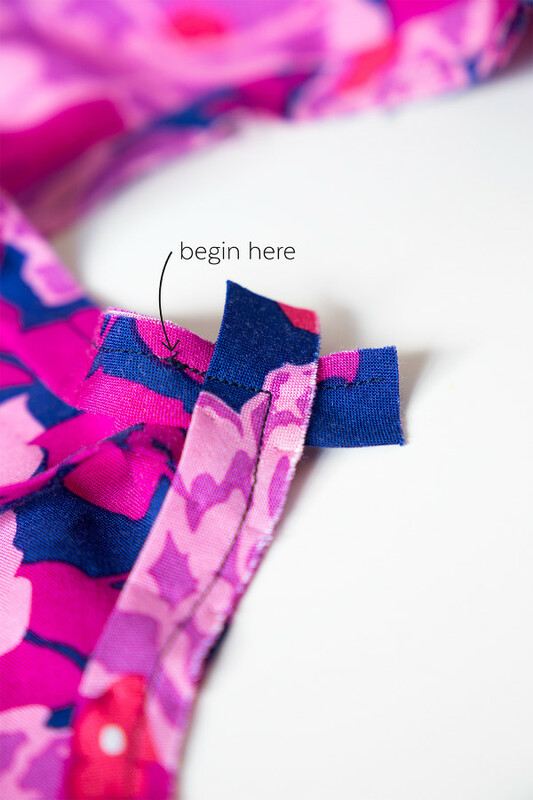 When you get to the other corner of the keyhole, do the same process, making sure to sew the corner. While stitching the keyhole, make sure to not sew over the ties other than where you had already basted them. Reshape your keyhole on the ironing board and press and steam once more. Let cool in it’s desired shape. 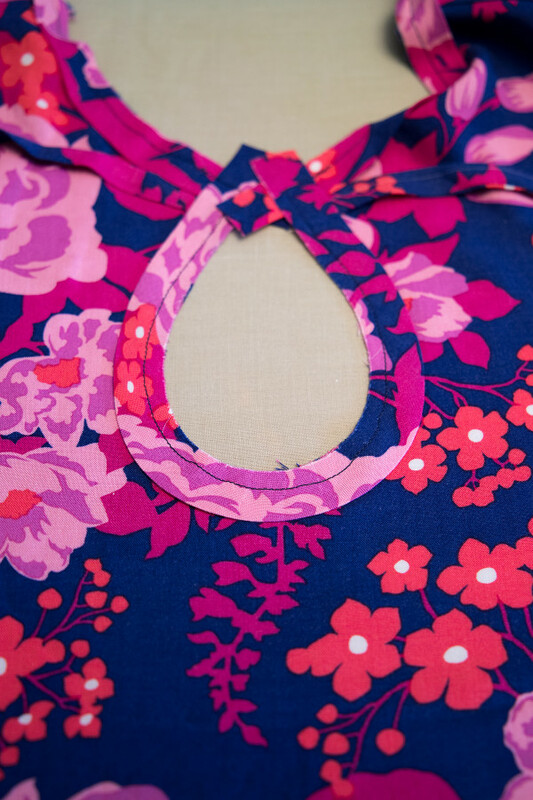 Step 7: Clip the corners of the keyhole and trim all seam allowances around the neckline and the keyhole down to 1/8″. 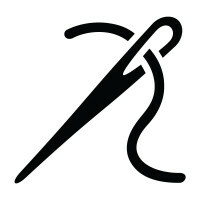 Use either pinking shears or clip notches every 1/2″ along the seam allowances. Step 8: Now it is time to turn the bias facing to the wrong side of the garment. I like to iron the facing up and away from the bodice, leaving the corners of the keyhole alone. You don’t want to iron the bias tape flat. Simply press along the seam line. Step 9: Push the corners of the keyhole out. A slight tug of the ties will help. I like to use the end of a knitting needle to push corners out. Step 10: Press the bias facing to the wrong side of the garment. Make sure the bias facing is not showing on the front of the garment. I usually have about 1/16″ of the bodice piece folded back with the facing. 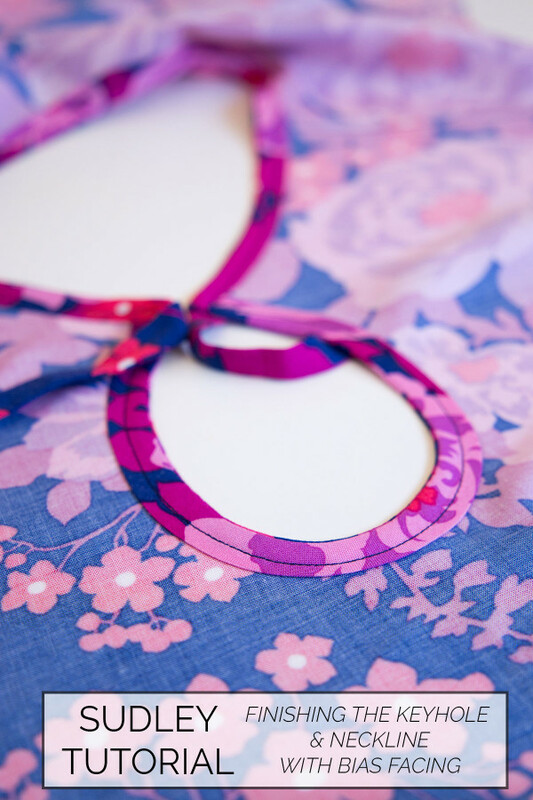 Step 11: Before pinning, place bodice right side down on your ironing board and shape the keyhole in it’s desired shape. Steam and press the bias facing around the keyhole. Leave the garment alone on the ironing board till it is cooled. Take this time to have some lunch, do a load of laundry or whatever else you might need to get done. 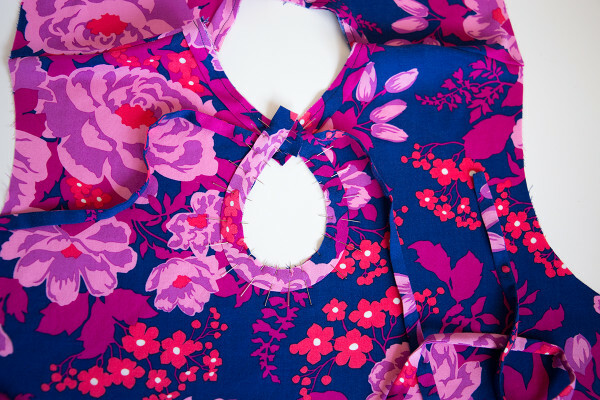 Step 12: Once the garment is cooled, pin the bias facing around the neckline and keyhole. Stitch 1/4″ from the the folded edge circling all the way around. If you would like to avoid seeing stitches on the front of your garment, you may hand stitch the bias facing on the wrong side. When done stitching steam and press making sure the keyhole and neckline are in their desired shape with no ripples. And, that’s it! Not too challenging at all. Continue along with the remainder of the Sudley directions to complete your garment. I hope you found this tutorial helpful! The dress turned out beautiful! Really love flowy dresses so this tutorial is for me :) Thank you for sharing!